Many of our Tattoo Tuesdays feature visited shops within driving range of Messiah, and a lot students have visited the same artists. 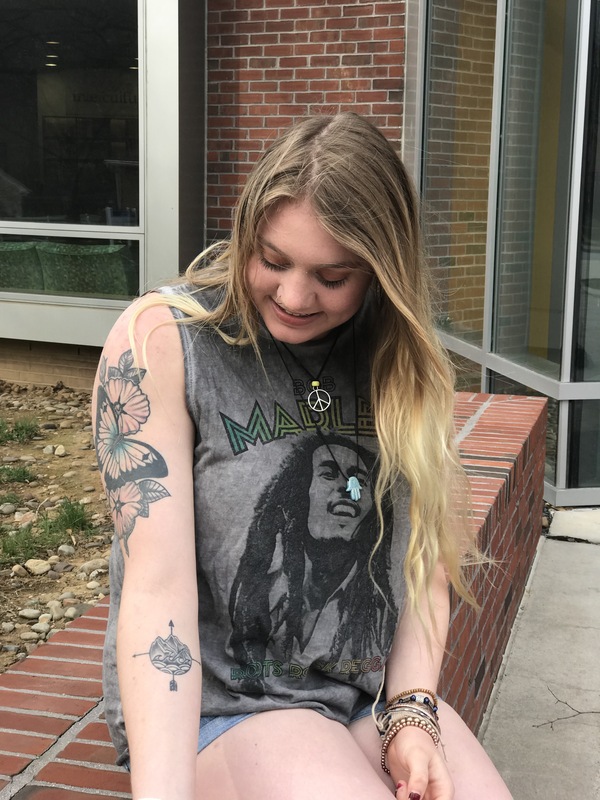 But this week’s feature, first-year journalism major, Celica Cook, got all four of her tattoos before even coming to college in her hometown in California. I have four tattoos. The first one is of a compass with a mountain and ocean scene inside. It is on my forearm, and it represents the lyrics from the song Oceans by Hillsong United. The arrows of the compass represent “spirit lead me where my trust is without borders,” and the mountains coming up from the ocean represent “in oceans deep my faith will stand.” I have one on the back of my arm (it doesn’t show in the picture) of a victory wreath with a cross inside. It means “victory in Christ.” The one on my upper arm is of flowers and butterflies. It just represents my love of nature, and the deer on my leg is also a representation of my love for nature and animals. I’m also vegan and don’t believe in the harsh treatment of animals. The deer represents this for me. I got all of my tattoos at home in California at a shop called “Gypsy King Tattoos.” My artist’s name is Tia. She was a close friend of mine that worked there. 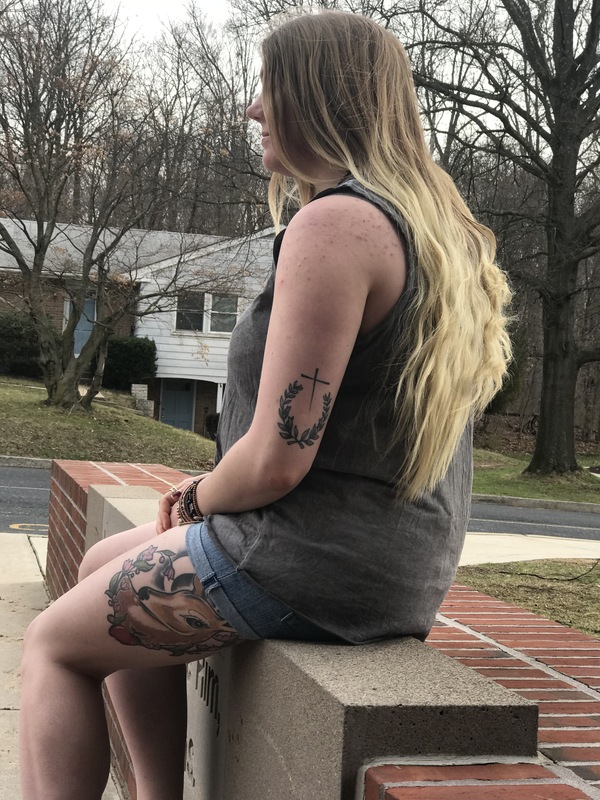 Was there an occasion that pushed you to go get your tattoos? I got the first one (the compass) after school on my 18th birthday. The second one (the victory wreath) I decided to get on the day I graduated high school. I was sitting in grad practice and I was like “I’m feeling victorious, I think I’m gonna go get a tattoo after this,” so I did. The last two I got this past summer. What were your pain tolerance tactics? When I got my first tattoo, I brought my friend Sam with me because I was nervous. She held my hand when they first put needle to skin, but once I got used to it, it wasn’t so bad. This one is also small, so it didn’t take too long. My other friends were constantly snapping me to keep me distracted. Since it was my birthday that day, my friends paid for it without me knowing. It was really sweet. What would you say to someone looking to get a tattoo? Make sure it’s an extension of who you are. Let it be a form of self-expression. Our bodies are temples, so why not paint them?